With out a doubt I have had some pretty hard slogs before on different adventures but nothing springs to mind that is comparable to today. Bashing out 30km on sand is no fun at all. I knew it would have to be a massive effort and so set off early, around 6:30am to make use of the cooler conditions and harder sand with the tide out. Not much to say really other than it was tough. The curve in the beach indicating Ahipara came into view soon enough, but that was it. The beach never seemed to get any shorter and the township never any closer. The sun is fierce, scoulding every piece of exposed skin. Smothered in multiple layers of sand caked sunscreen and long covering on my legs, arms and neck there was nothing for it but to trudge tediously on. The 90mile beach is a great opener to the Te Araroa. Already I’ve experienced the physical and mental aspects of the trail already. Many people make the decision here on the beach that they’ve had enough already and pull out off the trail. The physical aspects – the bottom of my left foot is killer on the sand, every step hurts. Hope it’s only temporary. But i know there is no easy way off this beach unless hitching a ride with one of the many passing 4WD’s. This early on in the piece though? No way. Push on it was. And with pushing on comes the mental game. Constant questioning in my head – Why am I doing this to myself? Always to be pushed aside by the positive voice, again, reminding myself that today was always going to be a long hard slog and that I have a rest day tomorrow with zero km’s to look forward. Then the reasons why I am out here pop into my head and all is well. On the plus side, 100km mark reached today, mostly done on sand and not a single blister thus far! What a relief to have finished 90 mile beach. Now bring on the jungle of the Herekino. 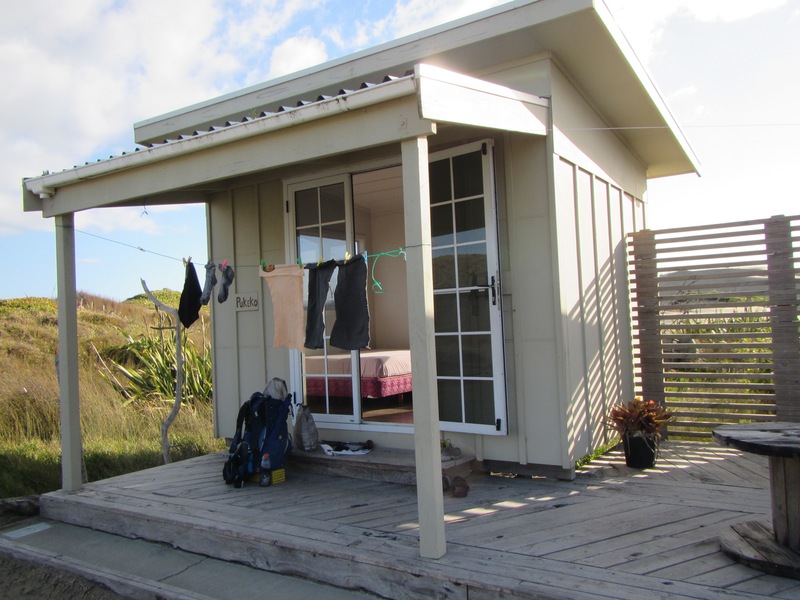 Checked in at the Ahipara Holiday Park. Washed and laundered. Walked a short distance down the road to Aunty G’s take away for fish and chips. Aunty’s is basically a food van parked in the driveway of a suburban house. Here I met Steve, a Maori teacher, who offered me a lift to the superette to pick up some beers. With my attitude of saying ‘yes’ for this trip it was an easy decision. Beer with fish ‘n’ chips and local hospitality, what a way to end a hard day. Kiwi’s love that people are walking Te Araroa and super excited when ever I tell them what I’m up to. Good on ya Mick. I’m jealous of your trip. Although not sure my jealousy extends to the three long days of beach walking. I remember my calfs being nackered after much shorter walks in East Gippy.